The risk of injuring your teeth while playing sport will always be a little bit higher. Mouthguards from Dentures at Clayfield in Brisbane can help keep them safe. 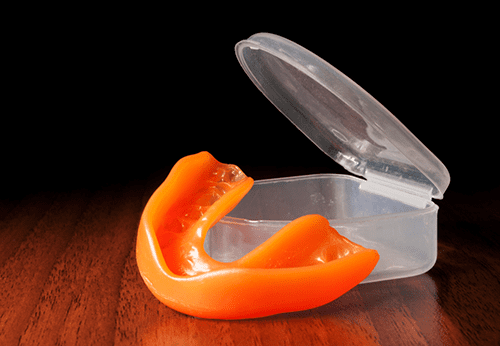 The benefits of wearing mouthguards are there for patients of all ages and Brisbane patients can now protect their smiles with custom-made mouthguards from Dentures at Clayfield. Many people enjoy being active through various different sports but when playing sport there is always the risk of injury. In particular, your dental wellbeing can be compromised but with the help of Dentures at Clayfield, you can protect your teeth from unwanted harmful impacts and even help prevent concussions. We custom-fit your mouthguard for you to give your teeth the best possible protection against unforeseen sporting injuries that may occur. Mouthguards are great for almost any sport ranging from AFL, baseball, boxing, hockey, ice hockey, karate, kickboxing, motocross, rugby, softball and wrestling. This makes it all the more important to have your mouthguard custom fitted for you. But why a custom mouthguard? People will often choose to purchase dental protection from local sporting goods stores or chemists that provide a self-mould mouthguard. This does not provide the same kind of safety and assurance you receive from a custom-fitted mouthguard at Dentures at Clayfield. The custom-fit mouthguard provides the best results and when compared to over-the-counter options, it is the clear choice for optimal player safety. Since their inception, mouthguards have become far more technologically efficient. A custom-made mouthguard from Dentures at Clayfield fits perfectly over each individual tooth and does not move around in your mouth. It also allows the player to speak and breathe without effort where an over-the-counter mouthguard may not. We offer a host of different colours and designs for our clients to choose from while also providing a case to keep the mouthguard safe and clean. We also place your contact details on the mouthguard should you ever forget it after a match. The durability of the mouthguard may vary from person to person but a yearly check-up is recommended. The mouthguard will generally last for about a season to 3 years depending on the age of the person. A child and a young teenager still have growing teeth and so need to change their mouthguards once a year. Adults and older teens will still need to have their mouthguards checked annually for any signs of wear and tear so as to judge whether a new fit will be needed. What can mouthguards do for you? The importance of a mouthguard can’t be stressed enough as the risks of injury a person can sustain in sport is quite high. A mouthguard can protect your teeth and your jawbone from serious injury or damage. Should a person get injured in this way, it can cost a fortune to have your teeth replaced or repaired. It may also cause a great inconvenience to patients who may have to miss days of school or work as a result. It has been theorised that a custom-fit mouthguard has the ability to prevent concussions. It does so by absorbing the shock of the impact, limiting the movement of the teeth and jawbone while also stabilising the neck and head of the individual. As such, mouthguards provide the best possible support for the player against unfortunate impact injuries and concussions. A frequently asked question we receive at Dentures at Clayfield is whether or not a person can wear a mouthguard if they have braces. It is always very important for a child or an adult to wear a mouthguard during sport and especially so if that person wears braces. The reason for this being that should the person with braces get injured without a mouthguard they may do some very costly damage to the braces or their mouth. This is potential damage that can be avoided with a custom-fit mouthguard over your braces. To make an appointment for you or your child, or to find out more about our mouthguards, please click here.